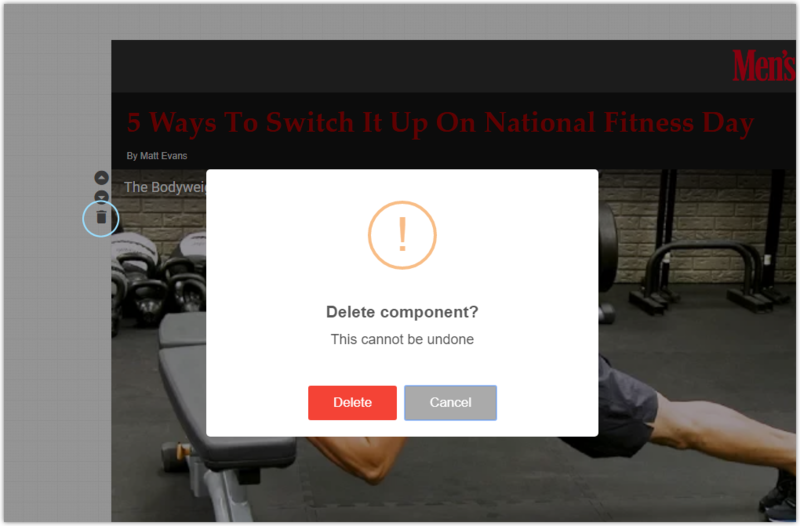 All placed components can be easily removed from an article or template using the ' delete' component option. Hover over the component that you wish to delete. The component toolbar will be displayed to the left of the component. Click the 'trash' button. A 'confirm' prompt will be displayed. Click 'Delete'. The component will be deleted. Save the article to commit the change. Deleting a component is permanent, once the article has been saved. If you delete a component by mistake and have not yet saved the article or template, you can recover the deleted component by refreshing the browser. Doing this will return to the last save point. Deleting a column component which has a style block applied does not delete the actual style block, it just removes it from the current article or template.